Welcome to our selection of hotels, guesthouses and condominiums on the French and Dutch side of St.Martin/St.Maarten. There are many hotels to choose from on the island, but we at GoBeach Vacations think that these properties, ranging from basic to luxury, offer good value for the money. We tend to like the smaller hotels and guesthouses more than the big resorts for their ambiance and more personalized service. Since we personally visit these hotels regularily we can assure you that they still live up to their standard. By the way, did you know that for larger groups a private villa may be more cost effective? Let us help make your stay on the Friendly Island even more enjoyable! For reservations call 1-888-71BEACH (1-888-712-3224) or e-mail sxm@gobeach.com. Hotel L'Esplanade [Grand Case, St.Martin] Overlooking the bay of Grand Case, the gastronomic capital of the Caribbean. The beach a few minutes walk down the hotel footpath. A beautiful new hotel, "on the hill above the rest!." The only Super Star hotel on St.Martin, awarded by Reed Publishing's Star Service! "La Samanna at half the price." 25 rooms. Now featuring Low-Season Summer Internet Specials! Caraibes Beach Hotel [Orient Beach, St.Martin] Formerly known as Cap Caraibes, a low-rise Mediterranean style resort right on the island's most popular beach. Featuring 35 spacious suites with fully equipped kitchenette. Summer Specials through Mid-December! Le Petit Hotel [Grand Case, St.Martin] Opened it doors December 15, 1996. A small Mediterranean style hotel, right on the beach of Grand Case, comprising 9 studios and 1 one bedroom suite, all luxurious, with a private beach terrace. Le Petit is a sister hotel of L'Esplanade. Now featuring Low-Season Summer Internet Specials! 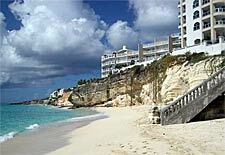 The Cliff [Cupecoy Beach, St.Maarten] New high-end condominium complex on one of the prettiest beaches of St.Martin. Great views, spacious condominiums, gourmet kitchens. Outdoor plus a 25 meter indoor lap pool. Gym + Tennis. Full service Christian Dior Health spa. One to Four bedroom suites plus two exclusive Penthouse Suites. Romantic Weekend Getaway package available. Bleu Emeraude [Grand Case, St.Martin] A new small condo type hotel right on Grand Case Beach. Modern condos with full maid service, breakfast, internet, etc. Handicap accessible. Choice of studio, one bedroom or two bedroom condos. Rainbow Beach Club [Cupecoy Beach, St.Maarten] New world-class luxury resort on beautiful Cupecoy Beach. Nicely appointed two and three bedroom condos. Excellent gym, tennis, pools. Walking distance to restaurants and casino. Special packages available. Palm Court [Orient Beach, St.Martin] Reopenend in January 2007 after renovation. In the heart of Orient Bay Village, 2 minutes from the the beach. Moroccan style, tropical gardens. Breakfast included. Early Booking Special, up to 40% off! Alamanda Resort [Orient Beach, St.Martin] Located right on famous Orient Beach. DeLuxe Rooms, suites and 2 bedroom duplexes. Caribbean Princess Condos [Orient Beach, St.Martin] A new beachfront condominium complex on Orient Beach. 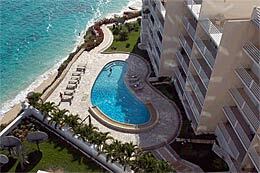 Each of the 12 two-bedroom condos offer great views over the word famous beach and the ocean beyond. Daily maid service, kitchen and fully air-conditioned. Princess Heights Condominium Complex [Dawn Beach, St.Maarten] Princess Heights Luxury Boutique Condo Hotel is located in the hillsides of Dawn Beach, Oyster Pond. All 51 deluxe studio, one and two bedroom suite have a beautiful ocean view overlooking Dawn Beach and the French island St. Barths. Internet Specials plus Winter Sale! Note: The following condominiums are rented by the week only (however, sometimes a 3-day minimum is allowed as well). Simpson Bay Beach Club Condo [Simpson Bay, St.Maarten] Located on the beach at Simpson Bay, this 2 bedroom, 2 bath condo is one of only 12 units. Italian marble floors, beautiful furnishings, central A/C and whirlpool tub in the master bedroom are only a few of the amenities this unit has to offer. Oceans' Edge [Simpson Bay, St.Maarten] A very nice one-bedroom and two-bedroom condominium located right on the quiet beach of Simpson Bay. No crowds, no big hotels! Perfect for couples looking for solitude and privacy, complete with spectacular sunsets! Royal Palm Beach Club [Cupecoy Beach, St.Maarten] Your room is situated on the ocean a few steps away from a beautiful stretch of sandy beach. Enjoy spectacular views from your fully air-conditioned, two/three bedroom, two/three bathroom furnished, modern equipped apartment. Have a cocktail on either of your two terraces as the cool tropical breezes soothe and refresh your soul. Ideally located for shopping, restaurants, and casinos, Royal Palm is the ultimate. Las Arenas Residences [Simpson Bay Beach, St.Maarten] Luxury beachfront apartments Simpson Bay Beach. Newly completed in 2006. Community Pool. Choose from Island Passion (1 bedr. ), Paradise Found (2 bedr.) and Rendezvous (2 bedr.). Coco Beach Club [Simpson Bay Beach, St.Maarten] Located right on the beach of Simpson Bay. Centrally located. Community pool. Choose from Unit Six or Nine. All are two bedroom condominiums. 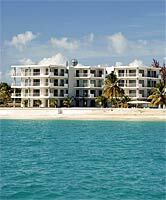 Caribbean Riviera Condominiums [Orient Bay, St.Martin] Luxury beachfront apartments on famous Orient Beach. There are two bedroom and three bedroom units. Palm Beach Condos [Simpson Bay Beach, St.Maarten] A new intimate and well designed gated community of only twenty-four units, all facing both the pool and the beach beyond. Choose from Sea Bird (2 bedr. ), Beach Dream (2 bedr.) and Beachside Retreat (3 bedr.). 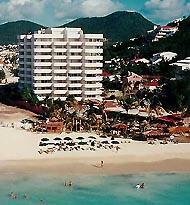 The Ocean Club [Cupecoy Beach, St.Maarten] A private luxury resort located directly on fabulous Cupecoy Beach. Spaciouse three bedroom units with marble floors, a sinfully large Roman soaking tub with a skylight overhead and private terraces to watch the glorious sunsets. Have you seen our St.Maarten/St.Martin Island Guide? Lots of information about beaches, restaurants, activities, a map, etc.etc. Print out a copy of the restaurant reviews to enjoy some of the culinary highlights of this island!